Our range of products include single mop wringer buckets and mop wringer buckets. 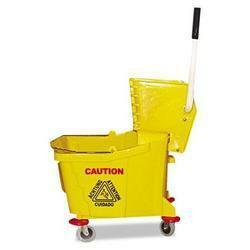 We are a topmost organization providing Single Mop Wringer Buckets to our clients. These buckets are equipped with squeezers and each bucket has capacity of 20 litres. These buckets are available in different styles and are produced using plastic, fiberglass and metal. These buckets are available in customized and non customized options and are plated with abrasion resistant material. These are free from defects.